 Presidio of San Francisco (GGNRA / Presidio Trust), San Francisco: Letterman Hospital (cafeteria).  City and County of San Francisco: The Sheraton Palace. Chinatown. Ritz Carlton Hotel. The Merchant Exchange Building. The Bay Bridge. The City Club. 301 Howard Street. Harrison at the Embarcadero. The jump from the roof was shot at 1 Bush Street.  Woodside, San Mateo County: Filoli Gardens & Mansion.  Downtown L.A., Los Angeles, Los Angeles County: Several of the scenes at CRS were filmed at what was once the Unocal 76 building on West 5th Street, but later became the Los Angeles Center Studios. The lobby and offices were filmed there, as was the hospital parking garage (see below) and a scene where Michael Douglas couldn't get into his briefcase. Other scenes were filmed in Chinatown. 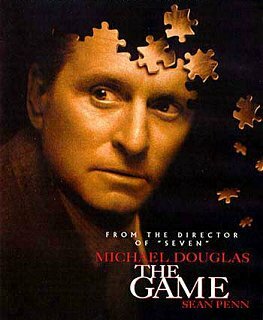 Even though it turned out to be a fake setup as part of the game, this movie featured a fictional Mercy Hospital. This is the same place that Pavel Chekov was rescued from in Star Trek IV: The Voyage Home, although that movie said it was located further south in the Mission District. Broadway was really the Filoli Mansion in Woodside. The ambulance says "Mercy Hospital San Francisco"  see above. This was actually filmed in the underground parking garage of what is now the Los Angeles Center Studios on West 5th Street and Bixel Street, Los Angeles. or West -6th Street in downtown Los Angeles. Ritz-Carlton Hotel, 600 Stockton Street. Above the Stockton Street tunnel. Van Orton's taxi raced down Harrison Street before crashing into the bay at the Embarcadero. Two views from South of Market. The CRS Cafeteria was built in the old Letterman Hospital at the Presidio. The historic Sheraton Palace at 2 New Montgomery Street.